A growing number of UC undergraduates complete their degrees within four years — a trend UC leaders are looking to build on. UC has some of the highest graduation rates in the nation. Students alre also completing their degrees more quickly, with the percentage of those finishing within four years up from 46 percent a decade ago. Faculty and administrators from across the University of California are taking aim at a singular goal: how to help students more quickly earn a bachelor's degree. Similar discussions are taking place at the state and national level, as policymakers look to improve overall graduation rates — nationally just 60 percent of students who enroll in college finish their degree — and to help undergraduates finish college more quickly. UC already has some of the highest graduation rates in the country. Eighty-three percent of undergraduates complete their studies, an accomplishment that takes, on average, a little more than four years for freshmen and two years for transfer students. And those figures have steadily improved over the last decade. But UC administrators say more can and should be done, especially around increasing retention in demanding STEM subjects, improving graduation rates among underrepresented minorities and ensuring that students who want to finish quickly don’t have logistical hurdles standing in their way. A two-day conference at UC Riverside on Jan. 8-9 drew some 100 faculty and administrators from UC’s nine undergraduate campuses to consider ways to streamline academic requirements, create a more cohesive first-year experience and draw on data that can help pinpoint which students are at risk of falling behind. The pursuit of more timely graduation should not come at the expense of opportunities such as internships, capstone programs and study abroad that are important parts of students’ educational experiences, she said. Nor should it come at the expense of those students who need a little longer to complete their studies. The conference focused on areas that an in-depth look at student data had identified as key factors affecting timely completion, and provided an ideal way for campuses to learn from one another about successful efforts, said UC Provost Aimée Dorr. Across UC, innovations are helping to streamline planning and curriculum, improve retention, and cultivate the sense of belonging that is critical to student success, she said. UCLA recently completed a major overhaul of course requirements across its disciplines, with an eye toward requiring no more than 45 upper-division course units for most majors. The change is intended to help combat "curriculum creep," in which the number of course units required for some majors has risen over time without a careful scrutiny of whether all the requirements are necessary for the degree, said UCLA undergraduate dean Patricia Turner. The focus on assessing the right number of units for a major helps ensure that students have a clear understanding about what's needed to graduate and, in many cases, greater flexibility to pursue other academic interests beyond their major. 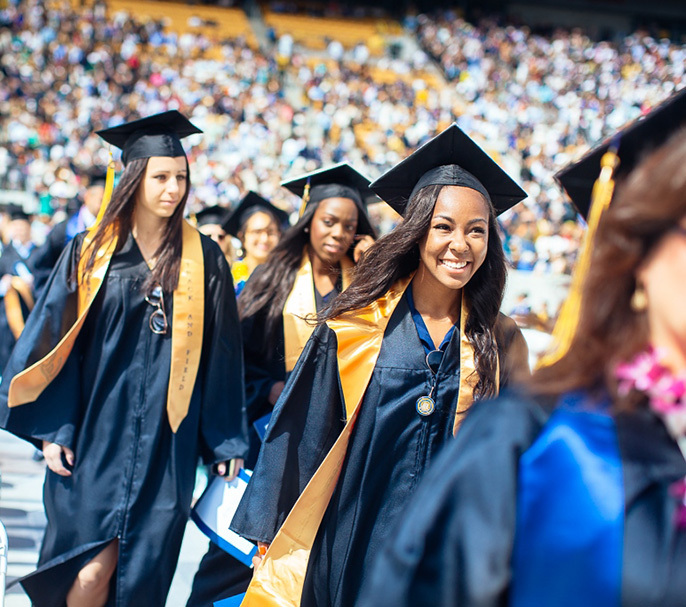 Noting the success of Challenge 45, UC San Diego has launched a similar assessment of upper-division requirements for each degree; several other campuses may follow suit. Innovative data tools are giving educators new power to zero in on the factors that encourage — or inhibit — student success. A tool at UC Davis has given administrators key insights into attrition patterns in high-dropout STEM subjects. They are able to see at a glance which sub-specialties have the most and least retention and what curriculum factors help students persist in STEM fields. The Ribbon Tool is being adopted across a consortium of 30 higher education institutions, including UCLA, UC Irvine and UC San Diego. UC Merced uses mid-semester assessments to identify students that are falling behind and target them for additional support, an approach other campuses said they would consider. Taking classes over the summer can be a great way for students to get ahead in their studies, as well as to pursue internships and study abroad experiences. It also can be key to timely graduation. At UC Irvine, for example, 80 percent of students who complete their studies in four years have taken at least one course over the summer. The hitch: Summer courses often cost extra, making students less likely to enroll. UC Berkeley is working with low-income and transfer students to use carry-over financial aid to cover summer session courses, and has dedicated additional funding to help students who don't have such funds. Developing new financial aid packages that cover the cost of summer session, educators said, could help more UC campuses and students take advantage of this underused resource. So, too, could promoting and expanding online offerings, a boon to students who spend the summer off campus. Research has shown that it’s not just academic factors, but also students’ perceptions of whether or not they belong on campus that influences their ability to succeed. Students from disadvantaged backgrounds are more likely to see failing a test or not making friends in their dorm as evidence that they don’t have what it takes to finish college. In recent years, UC Riverside, UC Santa Cruz and UC San Diego have developed programs that enable freshmen of similar backgrounds or majors to live and take classes together. UC Santa Barbara, UC Berkeley and other campuses have significantly expanded summer bridge programs, which bring incoming freshmen to campus for a few weeks over the summer to acclimate to the campus and get a jump start on their first year. Both approaches build students’ confidence and resiliency and help ensure they have a peer network during their crucial first year. Even small efforts, educators said, can have a positive impact on student perception. UC Irvine has launched a program to raise the visibility of faculty who were the first in their family to go to college. Faculty will wear T-shirts proclaiming them as first-generation, share their stories in class and highlight their experiences through promotional materials and events. It was an idea that many at the conference said they would take back to their campus.